The future supply of Russian oil is threatened by a likely decline in production levels, one of the country's top oil executives has warned. Lukoil's Leonid Fedun said $1 trillion would have to be spent on developing new reserves if current output levels were to be maintained. Recent figures show Russian output fell 1% in the first quarter of 2008. The possibility of less oil from one of the world's key suppliers will add more pressure to prices now at record highs. The surprise fall in Russian oil output in the first part of the year has raised fears about the ability of global supply to keep pace with demand over the next decade. 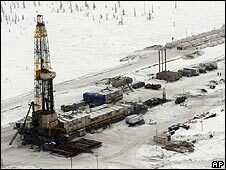 Russian production averaged 10 million barrels a day in the first three months of 2008, according to the International Energy Agency, down 1% on the same period last year. Blamed on supply problems in western Siberia and weather conditions making it harder to move drilling equipment, the fall contrasts with substantial output rises in recent years. In an interview with the Wall Street Journal, Lukoil vice president Leonid Fedun cast doubt on whether output could continue to increase. Once highly-productive fields in Siberia are slowly being exhausted and the huge cost of searching for oil in the untapped but remote region of eastern Siberia has deterred firms. "When the well's productivity falls, you have to keep drilling more and more," Mr Fedun said, referring to the steady depletion of older fields. "You have seen it in Alaska and the Gulf of Mexico and now you are seeing it in Siberia." Analysts at Citigroup recently said annual increases in Russian output could "no longer be taken for granted" but argued that production was expected to rise until 2012. One energy expert said the Russian industry was now acknowledging a crisis which had been evident to independent observers for several years. "We now see production peaked last year," Mikhail Kroutikhin, editor in chief of the Russian Petroleum Investor told the BBC. "I believe the decline will continue for quite a number of years." The problems have been caused by high tax levels and a shortage of financial incentives to invest in exploration, he added. Russian worries underline longstanding concerns about whether there is enough oil to meet the needs of the global economy, particularly fast-growing China and India. They are also a particular cause of concern for several of Europe's largest economies, such as Germany, which buy a large share of their oil from Russia. "Russia is not going to be a very reliable supplier of energy in a few years," Mr Kroutikhin warned.